In our line of work, we frequently and regretfully have to tell our clients: Cheap, Fast and Fabulous - you can't have all three, therefore you must pick the two that are most important to you. Fortunately with food, such is not the case. 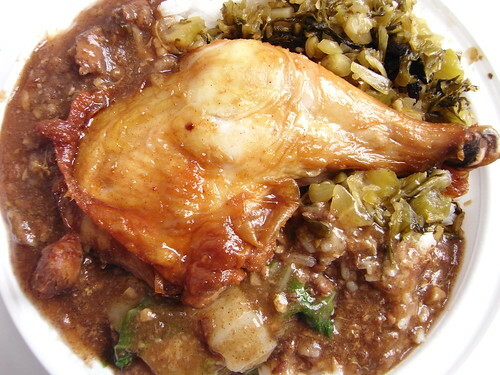 Wah Mei's chicken leg over rice is short of fabulous, but close enough to qualify! oh man, i didn't know they load up that much on meat sauce. i gotta get down there. i usually go the pork chop route though. We've found the chicken leg to be the better of the two, both here and at Excellent Pork Chop House. Wow, haven't been there since they reversed their name. It looks really good! Wow, they didn't used to give you that much sauce. I have to go back!